We can fight the global rise of right-wing demagoguery in two possible ways. There’s the establishment option embraced by centrist parties the world over, which promises a little more child care, better representation of women and people of colour at the top, and maybe a few more solar panels. But this option also comes with the same old austerity logic, the same blind faith in markets, the same equation of endless consumption with happiness, the same Band-Aids on gaping wounds. There are many reasons why this limited vision is utterly failing to stop the surge of the far right around the world, but the main one is this: It does not have nearly enough to offer. It does nothing to address the real and legitimate grievances that supercharge the search for scapegoats, nor does it give the people most endangered by the rising right enough hope for a better future. A society with extreme inequality, unmasked neofascist tendencies, and an unraveling climate is sick, and neoliberalism, as one of the major drivers of all of these crises, is grossly inadequate medicine. It offers only a weak “no” to the forces responsible, and it lacks a “yes” worth seizing. And perhaps we should thank Donald Trump for this newfound ambition, at least in part. The shamelessness of his corporate coup has done a tremendous amount to make systemic change seem more necessary. If titans of American industry can eagerly line up behind this man, with all of his viciousness, venality, vanity, and vacuousness; if Wall Street can cheer on news of his plans to let the planet burn and the elderly starve; and if so much of the media can praise his cruise-missile strikes, ordered over chocolate cake, as “presidential,” well then, a great many people are coming to the conclusion that they want no part of a system like that. With this elevation of the basest of figures to the most exalted of positions, the culture of maximum extraction, of endless grabbing and disposing, has reached some kind of breaking point. Clearly, it is the culture itself that must be confronted now, and not policy by policy, but at the root. What we have seen with insurgent left candidates and parties in the United States, Britain, Spain, France, and elsewhere are not perfect politicians or perfect platforms that have everything figured out. Some of the figures who have led these runs sound more like the past than the future, and the campaigns they have built often do not mirror the diverse countries they seek to govern, or at least not enough. And yet the very fact that these long-shot candidates and often brand-new political formations are coming within an arm’s reach of power—repeatedly stunning pollsters and establishment analysts—is proof of a very important fact, one that has been denied and suppressed for the many decades of neoliberalism’s stranglehold on public discourse: Progressive transformational change is popular—more so than many of us would have dared imagine as recently as just a year or two ago. In the many domains Trump does not control, we need to aim higher in our ambitions. The left-wing almost-wins of the past two years are painful, but they are not defeats. They are the first tremors of a profound ideological realignment from which a progressive majority could well emerge—just as geopolitically significant as the rise of authoritarianism and neofascism on the right side of the spectrum. Indeed, the weaknesses and missteps of these left candidates should be a cause not for despair but for genuine hope. It means that a much larger political tent is possible—it’s just a matter of collectively, and carefully, planting the right poles from day one. As many movement leaders are now arguing, a very good start would be accepting the premise that widening economic inequality and climate disaster are inseparable from systems that have always ranked human life based on race and gender, while the capacity to pit populations against each other based on skin colour, religious faith, and sexuality has been the single most potent tool for protecting and sustaining this lethal order. And if the political formation that has the guts to say all that also has a bold plan for humanizing and democratizing new technologies and global trade, then it would quickly seize back populist ground from the right, while feeling less like a blast from the past and more like a path to an exciting, never-before-attempted future. A deeply diverse and insistently forward-looking campaign like that could well prove unbeatable. 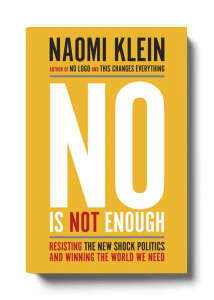 Excerpted from No Is Not Enough by Naomi Klein. Copyright © 2017 Naomi Klein. Published by Alfred A. Knopf Canada, a division of Penguin Random House Canada Limited. Reproduced by arrangement with the Publisher. All rights reserved.